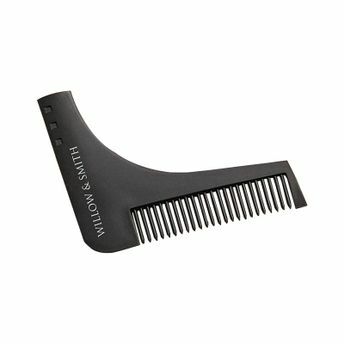 WILLOW & SMITH Beard Shaping Template Plus Beard Comb is the ultimate comb for men and it's never been easier to shape your facial hair with precision and speed while maintaining symmetry. The simple shape of beard comb is specifically designed with your beard in mind and it offers a multitude of shaping choices and styling options - simply adjust the curve angle and use different leveling measurements to try something new; even shape your neckline with ease. Combine with trimmers or a razor or moustache scissors to achieve an accurate trim or crisp shave. Explore the entire range of Beard & Moustache Care available on Nykaa. Shop more WILLOW & SMITH products here. Explore the entire range of Beard & Moustache Care available on Nykaa. Shop more WILLOW & SMITH products here.You can browse through the complete world of WILLOW & SMITH Beard & Moustache Care .